This year, we received a record number of submissions to our Top 50 Systems Integrators list, so inevitably, some prolific companies ended up missing the cut. The following is a selection of installations performed this year by firms that came in just shy of the list. Earlier this year, Daytona International Speedway (DIS) announced the launch of the new Daytona Technology Platform Powered by CDW as part of the expanding network of companies that are supporting the unprecedented $400 million DAYTONA Rising redevelopment project. Six companies comprise the inaugural group of technology partners including Rockledge, FL-based integrator, The Integration Factory. The Integration Factory, a women-owned systems integration firm for low-voltage systems design and installation, will provide a multifaceted AV system that will enhance communications throughout the property. Using a combination of stand-alone subsystems and integrated solutions, The Integration Factory’s system will include an upgraded loudspeaker system for the guests in the grandstands and the five new injectors; provide audio and video to key areas of the infield, the suites and chalets; provide a 4K video system backbone; and more. Marco, headquarters in St. 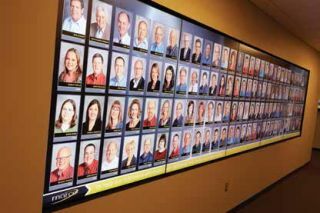 Cloud, MN, implemented in July 2015 an expansive employee photo wall utilizing the X2O Media Platform. With the visual communications platform providing simple content updating, the video wall has become a key element in supporting Marco’s culture as the company continues to experience rapid growth. When Marco had fewer than 100 employees, it began the tradition of hanging printed pictures of every employee—sorted by hire date—on a 30-footby- 10-foot wall. As the company grew to more than 900 employees, the wall wasn’t large enough and the process of sorting printed photos became cumbersome and time consuming. For its tradition to live on, Marco required a solution that would accommodate the company’s growth and automate the sorting process. The answer was an employee photo video wall. Featuring 55-inch displays in a five-by-two configuration, Marco’s video wall cycles through pictures of all employees in 1920x1080 resolution. If an employee joins or leaves the company, the photos are automatically resorted. Marco displays additional employee content, such as recognizing winners of the company’s C.A.R.E. (Customers Are Really Everything) award, in a scrolling ticker below their photo. In addition, Marco can easily update and display its office locations as the company continues to expand geographically. AVCON is a professional audio-visual systems integration firm that specializes in providing presentation, conferencing, and collaboration solutions to corporations, houses of worship, hospitals, universities, retirement communities, athletic stadiums, performing arts centers, museums, and any other organizations that desire a partner they can trust to deliver high-value results with exceptional service and guaranteed success. In 2012, Bayer CropScience initiated a multi-million dollar renovation project to update its facilities. This included integrating state-of-the-art presentation, conferencing, and collaboration solutions into spaces varying from more than 50 huddle/small conference rooms to boardrooms, digital signage, and an all-hands meeting cafeteria. Bayer CropScience hired AVCON initially as part of the engineering, design, and construction planning team. As the project and the relationship evolved, AVCON was selected to integrate the audiovisual solutions as well. The project was completed in February of 2015. With 5,000 seats, Overlake Christian Church (OCC) in Redmond, WA has the largest seating capacity of any house of worship in the Seattle metro area. To properly accommodate the variety of events the facility hosts, OCC called upon Morgan Sound to design and install a new sound system. Following a comprehensive study of the acoustical space and available rigging points, Morgan Sound installed the first STM system in a U.S. house of worship. The main STM system consists of 10 NEXO M46 mid-high modules coupled with 10 B112 low-frequency modules per cluster in a leftright configuration. Three NEXO M28 down fill speakers per side are attached under the main arrays. Two each of a three-box NEXO GEO S1230 speaker cluster were installed for balcony outfill. Twelve NEXO S118 subwoofers are flown in the center of the church in cardioid mode to facilitate even subwoofer coverage throughout the whole space. The amplifier complement includes 13 NEXO NXAMP 4x4 and two each NXAMP 4x1 amplifiers for a total of 212,800 watts of power. All the amplifiers are connected via Dante for maximum flexibility. Over the past summer, Sound Stage made some technological renovations to Archbishop Edward McCarthy High School in Southwest Ranches, FL. Sound Stage designed and installed the new audiovisual system for the school’s i-Catholic multi-classroom facility. The system consists of four three-by-three (nine 46-inch displays each) video walls using Planar Clarity Matrix LX46HDS-L ultra-narrow bezel displays. Each video wall has a pair of Bose MA12EX loudspeakers for audio playback or for sound reinforcement using a Shure four-channel ULXD4Q digital wireless receiver with two Shure ULXD2/SM58 handheld transmitters and two ULXD1 belt-pack transmitters with MX153 headset microphones. An AMX DGX16 16x16 digital media matrix switcher provides video distribution to the video walls and provides system control via a control room MSD-701-L Modero S series touchpanel and TPC-IPAD integration for wireless mobile control using an Apple iPad. Instructors can interface with the system using eight DX-Link Mulit-Fromat video wall plate transmitters for VGA or HDMI inputs with audio to the systems.